"Conscience...! That stuff can drive you nuts." In the decade following the mass introduction of color into Hollywood films, it seemed that the choice was often to go with color for musicals and major films or go with black & white for smaller films and "gritty" dramas. Although in many cases the decision was financial, it was also very often an artistic choice, with black & white conveying a documental, naturalistic feel that some subject matter requires. During the height of the studio era, there were serious and important films made that were not Cinemascope extravaganzas with exotic locales and all-singing, all-dancing casts. On the Waterfront, released in 1954, was a seemingly small film about an unattractive subject that amazingly dominated the Academy® Awards, takes its place in the top ten of the AFI list of the top 100 films of all-time and stands as one of the best motion pictures ever made. At the heart of the film is the script by Budd Schulberg that is perhaps the best American screenplay ever written. The cast of characters is rich in detail and depth, the plot is brimming with dramatic themes and the "torn from the headlines" message of the story with its threads of love, betrayal and redemption is as riveting today as it was 50 years ago. Schulberg was awarded the Best Writing for Story and Screenplay Oscar® and some of the scenes he wrote in this film are among the most memorable in cinema, including the taxi sequence between the two brothers, Terry (Marlon Brando) and Charlie (Rod Steiger) Malloy. It is the hard-hitting and literate nature of the script that lays the foundation for director Elia Kazan's heightened realism and the cast's powerful acting. It is an easy statement to make in asserting that this is one of the best—if not the best—acted film dramas ever made in Hollywood. Elia Kazan is at his best in combining natural settings with the emotional depth of Method acting. 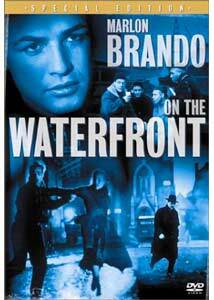 On the Waterfront was filmed on the cold and wet docks of New Jersey. Actual dockworkers were used as extras and the whole proceedings have an eerie, pseudo-documentary feel that enhances the realism of the story and transcends the dramatic elements of its love story and gangster action. Kazan was in a rocky period of his career at this time, following the rise of the House Un-American Activities committee in Congress, which sought to root out Communists in Hollywood. He is one of those who "named names" during their investigation and many in the motion picture industry have not forgiven him to this day. This was shown explicitly in 1999 when Kazan was awarded an Honorary Oscar® "In appreciation of a long, distinguished and unparalleled career during which he has influenced the very nature of filmmaking through his creation of cinematic masterpieces." There were many protests against the selection and many attendees of the ceremony refused to applaud. Some have said that On the Waterfront was an attempt to justify the testimony in fictional terms. Kazan received his second Best Directing Oscar®, adding to his statuette for directing Gentlemen's Agreement in 1947. Other films of note directed by Kazan include A Streetcar Named Desire, Viva Zapata!, East of Eden, Baby Doll and Splendor in the Grass. The story of On the Waterfront is based on a real expose of union corruption and begins with a young dockworker, Terry Malloy, doing a favor for his "friends" in the union local by setting up a man who had agreed to give testimony to the Crime Commission. Thinking that the purpose was only intimidation, Terry is shocked when he hears that the "stool pigeon" has been pushed off the roof. In the course of the next few days, he meets the sister of the murdered man, Edie Doyle (Eva Marie Saint), learns more of the true nature of his "friends" and ultimately must face a crisis of his own conscience. Among the colorful characters in the film is Father Barry (Karl Malden), who attempts to help the oppressed dockworkers that struggle against the abuses of the union run by Johnny Friendly (Lee J. Cobb). The tale is ultimately one of redemption as Terry, who was a boxer with promise, has his career destroyed by taking dives in fixed fights, and finds he has betrayed himself in helping Friendly and Charlie use the power of the union to blackmail and extort money from honest workers. It is also a love story, as Terry finds himself drawn to Edie in the pain she feels at her brother's death, and is wracked by his own guilt in the murder. And it is a gangster story, as Friendly and his goons stop at nothing to maintain their position of power on the docks. Heading the cast, this role won Brando his first Oscar® and his performance is one of the most compelling ever committed to celluloid. Fueled by the multi-faceted script, his characterization is potent in its evolution and complexity. When we see Terry in the opening scenes, he is portrayed as a fairly slow-witted, punch drunk ex-pug who the gang keeps around because they like him and admire his past as a prize fighter. Having never given much thought to the complexities of life, Terry finds himself unable to cope with the series of events that surround the Doyle murder. Father Barry evokes questions of conscience in his mind, Edie prompts him to consider the nature of his humanity and his growing awareness of his own part in the corruption in small and large ways all combine to force him to grow as a human being, to be worthy of Edie's love and the respect of his fellow man. As he contemplates confronting his enemies, he says to her, "They always said I was a bum. Well, I aint a bum, Edie." In addition, Brando adds his own nuances to the character, including slight makeup to his eyebrows to give the impression of a real ex-fighter who has taken many blows to the face, and his delicate acting, like the way he handles Edie's glove, putting it on his own hand when she drops it. One of the most interesting character attributes that Schulberg applies to Terry is his love of pigeons, which he raises in a rooftop coop; Brando's acting with the birds is just spectacular. Ultimately, it is the hallmark of Brando's film work—the way he evolves his character—that makes Terry such an indelible figure. Many actors give us little sense of the process that changes a character throughout a plot; often the person is essentially the same in the first scene as they are in the final scene, despite what they might have experienced. Also, the lack of fundamental understanding of their character makes dramatic reversals hard to believe. But the realism of the dialogue and the beautiful underpinning of Terry's character by writer and actor make his decisions not only believable, but inevitable. In Terry's case, he is literally a different man at the end of On the Waterfront, and we see it in the way he moves and talks and thinks and find that we, the audience, are changed. Eva Marie Saint was awarded the Best Supporting Actress Oscar® for her performance as Edie in her first film role. She has a freshness and raw, emotional appeal that strikes a chord with the audience as much as with Terry. Her conflicted love, and her desire for justice in the murder of her brother add powerful layers to both the love story and the gangster story. All three male co-stars received Oscar® nominations. Malden's activist priest has some powerful scenes as he battles the influence of the mob on his congregation and is forced to come down from his altar and take the fight to the alleys of the waterfront. As the mob boss, Friendly, Cobb is a menacing figure who shows no qualms and no hesitation in grasping all that he feels is his entitlement. Steiger portrays a man of intelligence among the unread, who cynically abets the organization but finds himself on the wrong side of the equation when his younger brother bucks the established order. Other Oscars® wins for On the Waterfront (besides Best Picture) included Best Art Direction-Set Decoration, Black-and-White for Richard Day; Best Black-and-White Cinematography for Boris Kaufman; and Best Film Editing for Gene Milford. Also nominated for Best Music Score was Leonard Bernstein, and it is noteworthy that this was the only score he wrote for a film that was not a musical. It is a dazzling and unique musical accent for a dazzling and unique film. On the Waterfront contains depictions of fundamental and universal human values and experience. The movement from ignorance to awareness is elemental in our nature as we grapple with understanding our humanity. Few films can be gripping and entertaining, yet somehow teach us something about ourselves. This film is a winner and must-have for any DVD collection—the highest of recommendations. Image Transfer Review: The image transfer is beautiful and does just to this award winner. Crisp black & white can have a unique quality and the efforts in achieving the realistic naturalism are finely rewarded by this disc. The film is presented in its original aspect ratio of 1.33:1 and the digital remastering gives us an On the Waterfront that has never looked better. This is a job well done on a film that is almost 50 years old. Audio Transfer Review: The soundtrack is the original mono and aficionados of film preservation will applaud the way the sound has been enhanced, yet maintains its original integrity. Certainly there is no reason to bounce the sound of a film like this across the stereo spectrum, but it is also great to hear the subtle audio work that establishes an environment for the story. The musical score is given a fine crisp treatment that will be a revelation to viewers who have only seen On the Waterfront in muffled TV presentations. Extras Review: On the Waterfront is a Special Edition and some nice supplements enhance both our enjoyment of the film and our understanding of its creation and method. In many ways, this is a landmark cinema experience and I applaud the inclusion of this material. The menus are very nicely conceived, easy to navigate and definitely add class to the release. The commentary with film critic Richard Schickel and Elia Kazan biographer Jeff Young is a mixed bag of information as these two spend a lot of time stepping on each other's information and often drifting along tangents. I think that is inherent in commentaries by figures who are a generation away from the production as these two are. However, they do provide a wealth of information about the film, in between their opinions. Contender: Mastering the Method (25m:12s) Interviews with Rod Steiger, James Lipton, Jeff Young, Richard Schickel and Patricia Bosworth explore centrally the taxi scene between the brothers, and more generally Method acting. There are generous anecdotes about the making of the film and about Marlon Brando and Elia Kazan. This film influenced a generation of actors and this documentary attempts to understand why. A Conversation with Elia Kazan (11m:59s) "As close as I came to making the film I want," says Kazan of his masterpiece. This is more a series of spliced together quotes than a conversation, but it is interesting as a document nonetheless. Video Photo Gallery (4m:29s) � This is an excellently conceived featurette. Stills from the movie and behind-the-scenes shots are shown backed up with music and dialogue from the film and nicely encapsulates the story. Anyone interested in taking their family photos and joining the desktop video revolution should take a look at how effective this presentation is. This is one of the best films ever made and this DVD does it justice. On the Waterfront features some of the finest acting ever committed to celluloid, some of the finest screenwriting ever enacted, and contains one of the most potent stories ever told in an American film. This is an absolutely essential addition to any respectable DVD Collection.